You know how the old saying goes that “presentation is everything”? 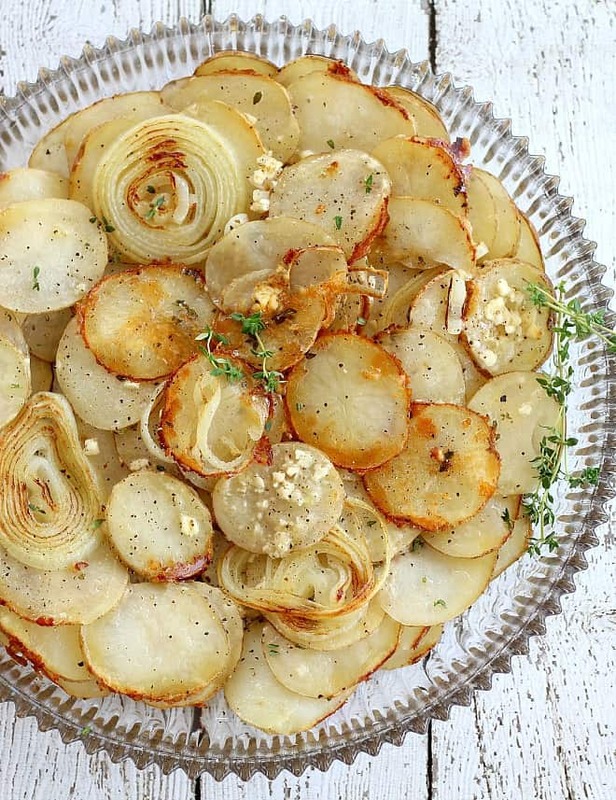 Well, when it comes to presenting a meal, I wouldn’t say that looks are EVERYTHING… but this is one beautiful way to present a potato side dish to those you love and want to impress. And how it looks is just the start of what’s great about Upside Down Potato and Onion Tart. Baking the dish in a hot oven helps to caramelize the top, or what will become the top, of the potato and onion tart. Fresh thyme adds an earthy quality and three different kinds of cheese combine for a complex bite, and let’s not forget a touch of garlic to finish it off. You can dress this up or pare it down with extra or less cheese, and you can even leave the onions out… though why you would do that, I can’t imagine. The recipe as written uses Parmesan, feta and mozzarella, but you can use whatever combination you like. If you REALLY love cheese, then dare to double it. Now this just goes in the oven until the bottom, soon to be top, gets golden brown and crunchy. 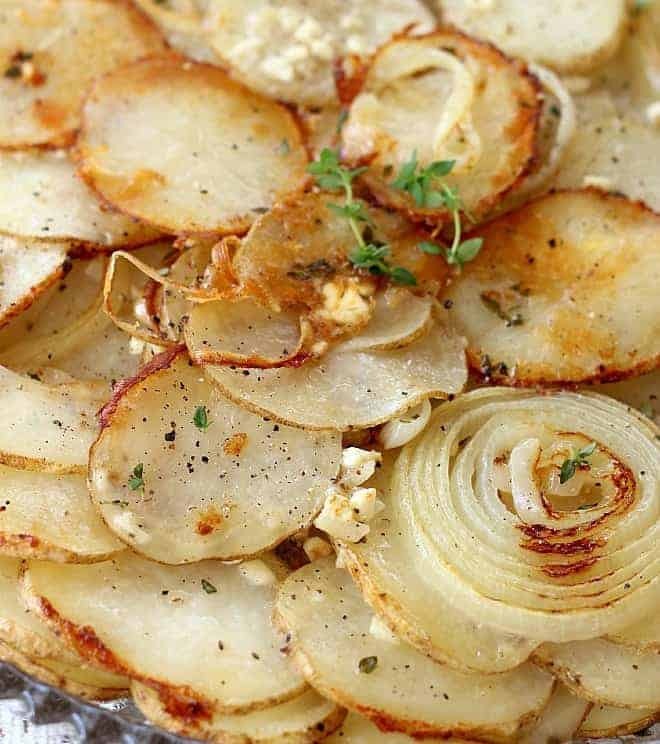 When the tart is flipped over on the serving platter, some of the onions or potatoes might stick to the pan. Just scrape them off with a spatula and place them back on the tart. This usually happens to me when I’m trying to get the potatoes extra crispy or when I don’t add a lot of cheese because the cheese is kind of the glue for holding everything in place. Upside Down Potato and Onion Tart will look beautiful once it’s all put together, ready for an impressive presentation. This is one side dish that will present well and taste even better! Equipment list: Large non-stick oven safe skillet, 12-inch or better. Cast iron also works. Serving platter that is larger than skillet. 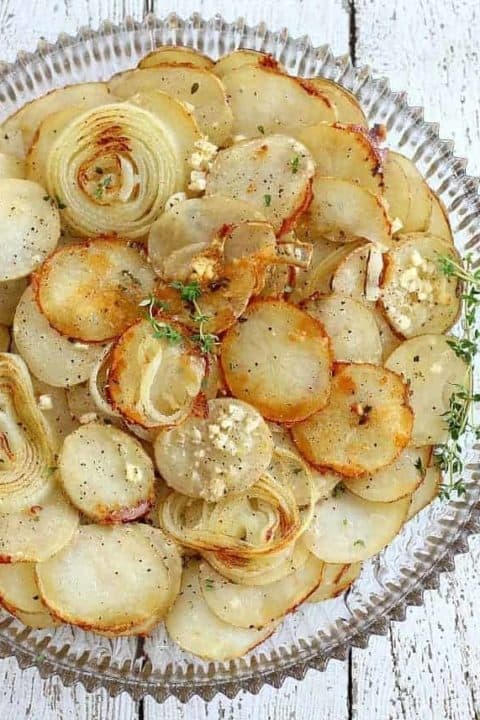 Cook's notes: When flipping the tart over onto your serving platter, some of the onions and potatoes may stick to your pan. Just have a spatula ready and carefully scrape them off the pan and place them back where they belong on the tart. If you really like cheese, this tart can be made with any favorite cheeses you have on hand and I've made it with double the mozzarella and have used cheddar in place of the Parmesan. Experiment to your own liking. Preheat oven to 400F degrees. Melt the butter in a 12-inch non-stick skillet or well seasoned cast iron skillet over medium heat. 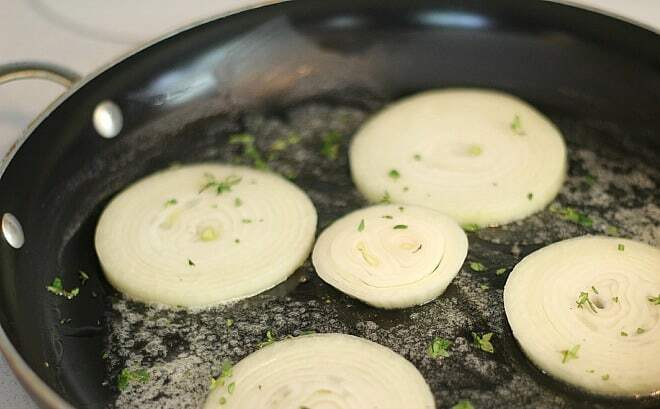 Add the thyme and about 5 slices of the onion (reserve the remaining slices), placed equally around bottom of the skillet. Cook for 5 minutes, until onion begins to soften. Do not stir. You are making a design for the top of the tart. 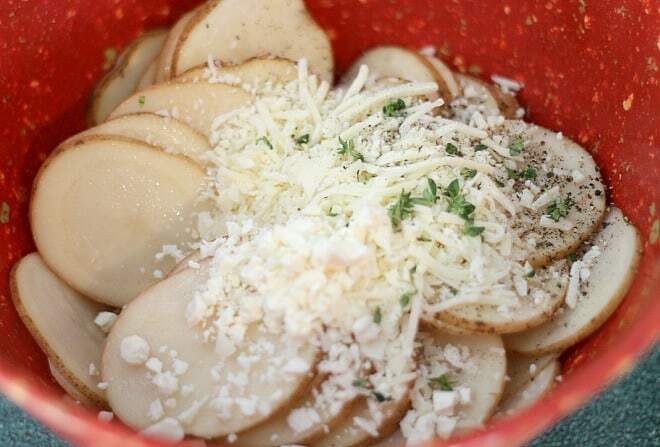 In a large bowl, place the sliced potatoes, 2 tablespoons olive oil, Parmesan, feta, mozzarella, garlic, salt and pepper. Toss to combine. You should have several slices of the onion left. Chop these and add to the potato mixture. Mix again. 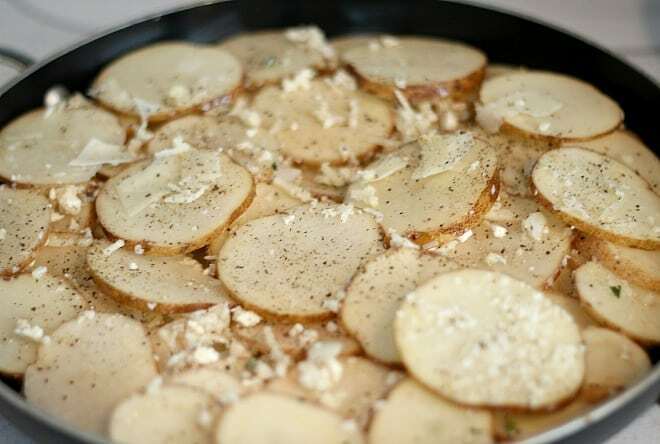 Layer the potato slices on top of the onion slices and continue in layers until the pan is full. You may need to add the cheese that doesn't adhere to the potatoes between the layers as you go. Cover the skillet with aluminum foil and bake in oven for 20 minutes. Remove aluminum foil and bake an additional 20-25 minutes, until the potatoes are golden. Take skillet out of the oven and let rest for 10 minutes. Using a serving plate that is larger than the diameter of the skillet, carefully invert the tart onto the plate (using hotpads). 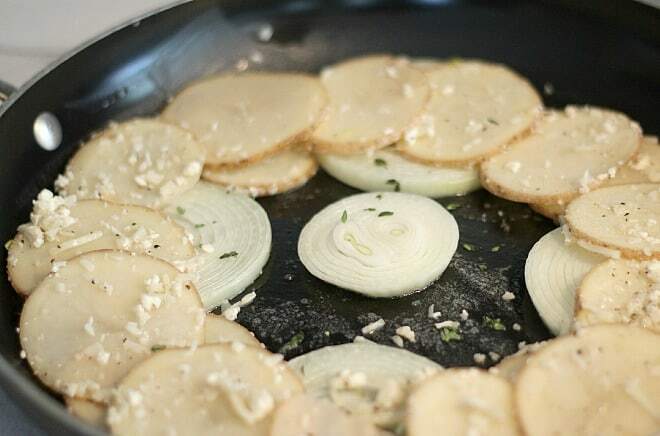 If some of the potatoes and/or onion sticks to the skillet, no worries - just scrape them off using a spatula and place back where they belong on the tart. Sprinkle with additional thyme leaves and black pepper. Optionally, grate more cheese on top or sprinkle with crushed red pepper flakes before serving. Hi Sally–Last night I was searching for a new potato dish to make with an assortment of Bohemian sausages my husband purchased. Tonight I made this dish…oh my goodness! All of us agree that this recipe goes into my “keeper” binder. Thank you for the great recipes! 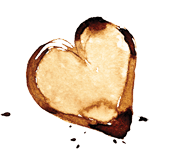 I simply love pursuing your site–your recipes never disappoint. Stephanie, You are so nice and I’m so glad this recipe worked with the sausages (Bohemian sausage sounds A-mazing!) Thanks so much, it really means a lot. WOW Sally! This is MY kind of food! Rustic, delicious and simple!!! And hello!?! 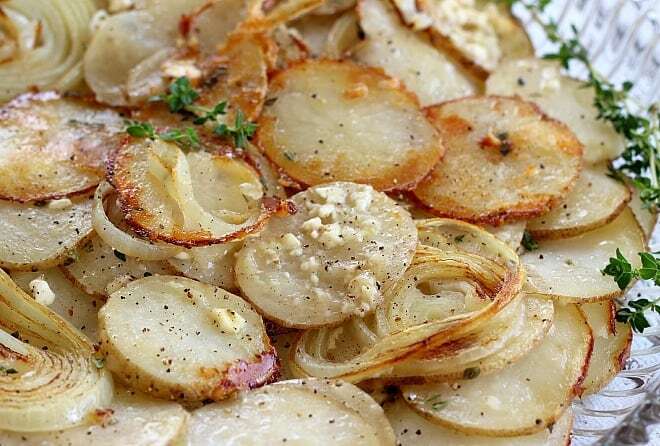 The combo of potatoes and onions is perfection! Beautifully done! I love potatoes. I’ve seen similar dishes but have never made them. I was so pleased with your Chicken with Tomato Basil Cream sauce that I think I’ll give this one a try too. Thanks Karen! If I may suggest another chicken recipe that is possibly my very favorite, try my Chicken Scallopini ;). Have a great week on the banks of Salt Creek. Sarah, I did try to make this as “light and healthy” as is possible, like you said, as light as potatoes can be. But yes, cheesier is definitely an option, depending on what everyone likes. Thanks for taking the time to stop by and comment!